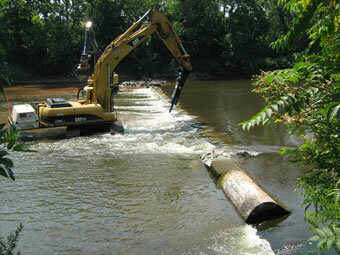 (11/P84) TRENTON - The removal of the first of three dams from the Raritan River in Somerset County that will open up a 10-mile stretch of the middle and upper portions of the river to fish migration for the first time in more than a century has begun this week, DEP Commissioner Bob Martin announced today. The project is being carried out and financed by the El Paso Corp. under the terms of a landmark agreement secured earlier this year by the DEP that will open up a large segment of the Raritan River for fish spawning. This is compensation to the public for harm to natural resources caused by past pollution at a refinery and three polymer plants that were operated by or affiliated with the El Paso Corp. 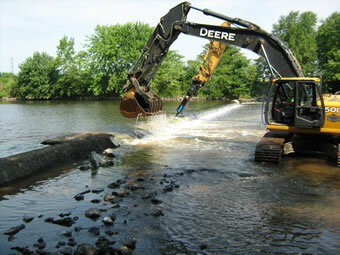 The first of the dams being removed starting this week is the Calco Dam in Bridgewater. That project should be done in two weeks, and removal of all three dams is expected to be completed by the end of 2012. "This is part of a continuing effort by the Christie Administration to protect and improve the quality of waters in New Jersey, and includes a DEP focus on water quality issues regarding the Raritan River,'' Commissioner Martin said. "The removal work getting underway this week will result in a significant environmental improvement to the Raritan River, making this a valuable habitat for fish spawning, improving overall environmental conditions in the river system, and expanding recreational opportunities," Commissioner Martin said. "Removing these dams will make it easier for kayakers and canoeists to use this river, and for outdoors enthusiasts to enjoy a river that is undergoing a steady ecological comeback,'' added Amy Cradic, Assistant Commissioner for Natural and Historic Resources. "This is a major win for the environment, allowing the reopening of these spawning areas which will help restore balance to the estuary." Dam removal will open up 10 miles of migratory fish habitat along a stretch of the Raritan that twists through a highly diverse residential, commercial and agricultural portion of Somerset County that includes Bridgewater, Bound Brook, Somerville and Manville. It also will open up about 17 miles of tributaries, including the Millstone River, to spawning. None of the dams were built for flood control. Calco Dam, located at river mile 20.9 and built by the Calco Chemical Co. in 1938 to disperse chemicals from its facility. The dam is essentially a large concrete pipe spanning the river that today carries and disperses wastewater into the river for the Somerset Raritan Valley Sewerage Authority. The authority has constructed a new outfall that will be operational shortly. The Nevius Street Dam, located at river mile 27 and constructed of rocks and mortar in 1901 for aesthetic purposes and later retrofitted to provide water to ponds on the Duke estate. The DEP and El Paso are working on a plan to ensure the river continues to feed water to these ponds after the dam is removed. The Robert Street Dam, a 6 ½-foot-high sheet piling and concrete dam located at river mile 27.9 and constructed prior to 1930 for purposes that are not known today. Species to benefit most from the removal of the dams are American shad, American eel, herring, and striped bass, which once migrated in prodigious numbers through the gravelly shallows of the Upper Raritan. Better water flow also will improve flushing of sediments, reduce nutrient loadings and improve conditions for tiny aquatic organisms that are critical to the food web in the river system. The settlement with El Paso resolved Natural Resource Damage claims made by the DEP against the Houston-based company that stemmed from contamination at EPEC Polymers Inc. in Flemington, Hunterdon County; Nuodex Inc. in Woodbridge, Middlesex County; EPEC Polymers Inc. in Burlington City, Burlington County; and the Eagle Point Refinery in West Deptford, Gloucester County. Investigations and/or cleanups are under way at those sites. The DEP uses funds secured from Natural Resource Damage settlements toward ecological restoration projects, typically in the same watershed or general area where resource damages occur.